For much of European history a single-handed sword with a blade length of roughly 30 to 32 inches was the norm. This held true with the Celts of the Iron Age, as well as the Viking and Germanic warriors of the so-called "Dark Ages." A relatively short single-handed cutting sword, with a broad and flat blade, was found to be adequate when used against the armour of the day and remained the battlefield standard for several centuries. Sometime during the 11th century a sword that featured a distinctly different appearance began to show itself upon the battlefield. These swords differed from previous types in ways that were subtle yet still dramatic in form. The cut still ruled the battlefield as the primary means of delivering a sword blow and this new type continued that trend. The blade still featured a cross-section that was flat and thin, and while this resulted in an effective cutting sword it also rendered the blade a bit too flexible for dedicated thrusting. Even though this new type shared these key traits with its shorter cousins it also featured a blade that was much longer and narrower. An average blade length of 35 to 37 inches is common for this design. Ewart Oakeshott designated this sword as the Type XI in his typology of the medieval sword. 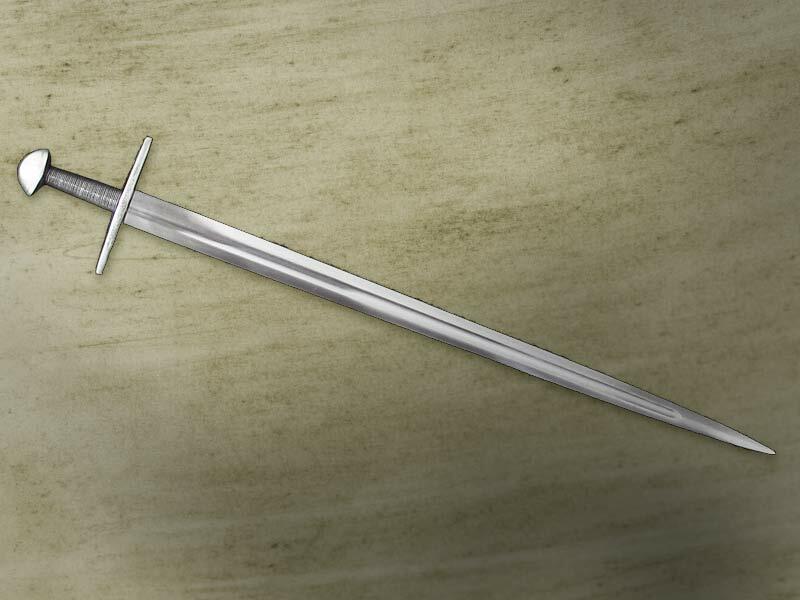 In Records of the Medieval Sword Oakeshott described the Type XI in the following manner: "This type is distinguished by having a slender blade, generally long in proportion to the hilt, with a very narrow fuller running to within a few inches of the point." This type of design offers a distinct contrast when compared to previous designs like Oakeshott's Type X. The long, narrow blade of the Type XI typically features edges that run nearly parallel to an adequate point. Many swords of this type are in poor condition, having been found in excavations and river finds. The thin cross-section typical of Type XI blades tends to result in heavily corroded tips when the swords are found in these environments. 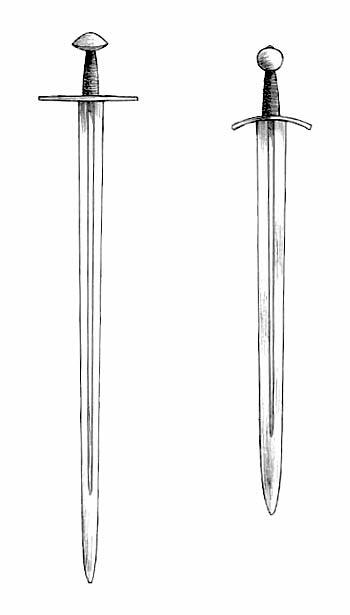 Consequently, many extant swords of Type XI feature points that seem to be rather rounded and almost spatulate, although some well-preserved examples feature well-defined points that are rather acute. The blade's narrow fuller will usually run nearly the entire length of the blade, and will often be poorly defined. The cross-guard found on the Type XI is typically straight and of rectangular form, with pommels generally being of brazil-nut or disc design. A few swords of the type have been found with disc pommels that feature strongly beveled edges of Oakeshott's Type H design. The Type XI is generally considered to belong to the high-Medieval period with an introduction in the early 12th century. However, this date should be approached with caution. A sword that was once in Oakeshott's personal collection, and that now resides in the Glasgow Museum, features details that may indicate an earlier introduction. This sword displays runes inlaid in white metal upon its blade that are of a distinctly Anglo-Saxon nature. These runes had fallen out of use in Anglo-Saxon culture by circa 900 AD. English manuscripts that are dateable to that period also feature swords with long slender blades and appropriate hilt designs. These illustrations may indicate swords of Type XI so the design may have been in use as early as the 10th century. The most famous sword of this type is undoubtedly one housed in the Weltliches Schatzkammer, in Vienna. This is the sword formerly used as a ceremonial sword at the coronations of Holy Roman Emperors, and is commonly known as the Sword of St. Maurice. It was previously assigned a firm date of 1198-1215 due to the engraving upon the sword itself as well as enamel work upon its scabbard. However, recent re-examination of the scabbard's embellishment (the scabbard was obviously made to fit the sword specifically) has shown it to be of a style commonly used in the 11th century. This information lends credibility to the belief that the Type XI was in use earlier than previously believed. The 11th century saw the rise of cavalry warfare as the primary means of giving battle upon the European continent, and the Type XI's longer blade seems a natural design for use by a mounted warrior. However, examples have also been found in England that would seem to predate this trend, such as the previously mentioned Glasgow sword. While the Type XI is a distinctive and well-defined type, there are a few swords that fall outside of its definition. One such sword is housed in the Museum of Ethnology and Archeology at Cambridge, with a second sword being housed in the Tower of London (possibly now at The Royal Armouries, Leeds). These swords exhibit many of the features of the Type XI yet their blades tend to be broader than the established standard. Because of these differences Oakeshott classified such examples as a sub-group, Type XIa. Dated from circa 1075-1100, this sword was found in an excavation and is in good condition. The blade features well-defined silver-inlaid inscriptions reading: SSPETRNUS, with +BENEDICATNTNSETMAT+ on the reverse. Dated from circa 1050-1120, this sword is perhaps one of the most famous and well-documented weapons to survive from the high medieval period. It is in a near perfect state of preservation. It was used as the Coronation Sword of the Holy Roman Empire and is now popularly known as the "Sword of Saint Maurice" of Vienna. Dated from circa 1100, this excavated sword is in poor condition with quite a bit of deep pitting and corrosion on the blade and hilt. Dated from circa 900-950, this sword was formerly in the collections of both D'Acre Edwards and Ewart Oakeshott. While its excavated condition is poor, this sword is still of great importance. The sword's tang is incised with runic letters, and the fuller features a silver lattice pattern inlaid in silver on one side, with runic characters on the other. These runes are of a distinctly Anglo-Saxon character and may indicate an earlier introduction for this sword type. Dated from circa 1100, this sword is in poor condition with a lot of deep pitting. 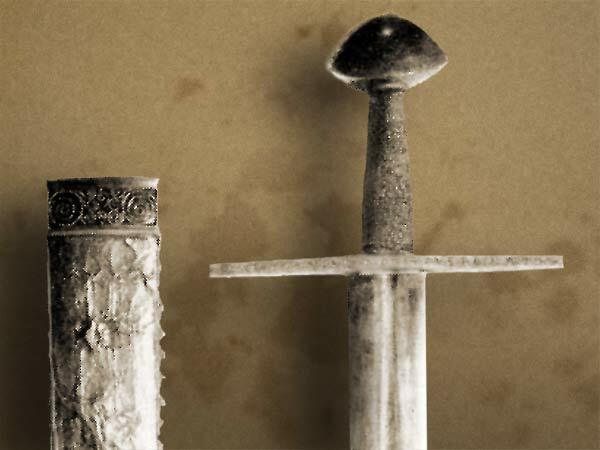 However, it does feature silver-inlaid letters upon the blade, with a small "Hand of God" in silver near the point. Dated from circa 1100-1125, this sword is in very good condition in spite of being excavated. There is a tiny inscription on one side of the blade that reads S O S. It has been suggested that these letters are the abbreviation for the words SANCTA O SANCTA. The grip is a modern replacement. Dating from the second half of the 12th century, this example has a flat disc pommel with a short downcurved cross. The blade is inscribed with the letters OSO and is missing several inches from its tip. Another sword form the second half of the 12th century, this sample has a short, straight cross with a unique pommel for this sword type. Swords of Types XI and XIa are difficult to find in period artwork. 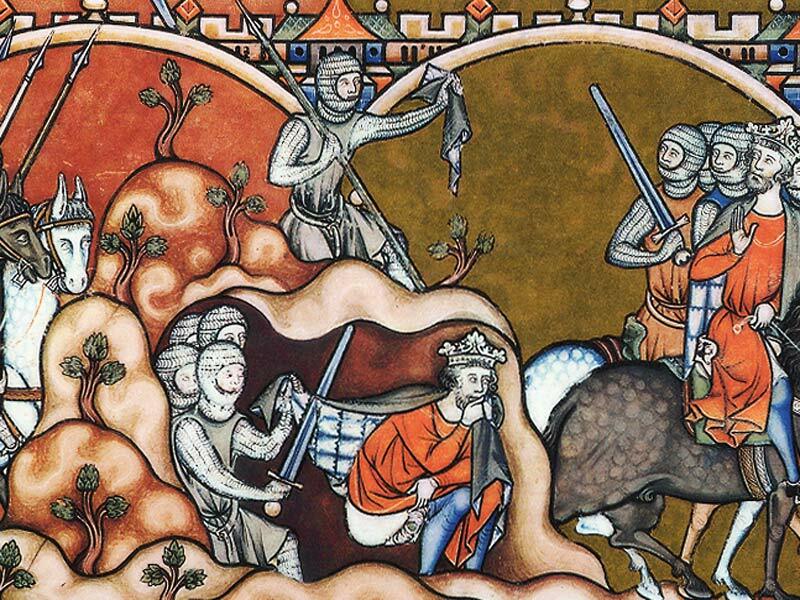 Several English manuscripts dateable to within the 10th century feature illustrations that may show swords of the type. Several swords wielded by the warriors shown on the Bayeux Tapestry may be of Type XI. However, the Tapestry has been repaired and reworked several times throughout its lifetime. Therefore, by its very nature it cannot be used as a definitive source of identification. Several images from the Maciejowski Bible show swords that might be interpreted as Type XI in form. The great bronze doors of the church of St. Zeno at Verona feature an embossed figure that may be holding a sword of this type. In the end, these examples are too ambiguous to clearly illustrate the sword's type. Not only is there a lack of Type XI swords in period artwork, but there is also a general lack of the type on the modern replica sword market. Arms & Armor of Minnesota manufactures the oldest example of a Type XI, a replica of the so-called Sword of St. Maurice. Angus "Gus" Trim of the Pacific Northwest features an interpretation of a Type XI as his model AT1214. Albion Armorers of Wisconsin offers two accurate Type XI recreations: the Ritter and the Hospitaller. At this time the author is not aware of any Type XIa replicas currently being manufactured. Given the number of surviving originals, as well as the lack of representation in artwork, the Type XI family doesn't seem to have been as popular or widespread as the preceding Type X or the later Type XII. Whether it was a development that focused on the increasing use of mounted troops or simply an indicator of the desire for a longer-reaching weapon is uncertain. Regardless of the reasons behind its creation, the Type XI illustrates an interesting development in the evolution of the medieval sword, and is very indicative of a specific period in history. It may not be considered a "classic" design by modern historians and collectors, but it is still deserving of our interest and further study.